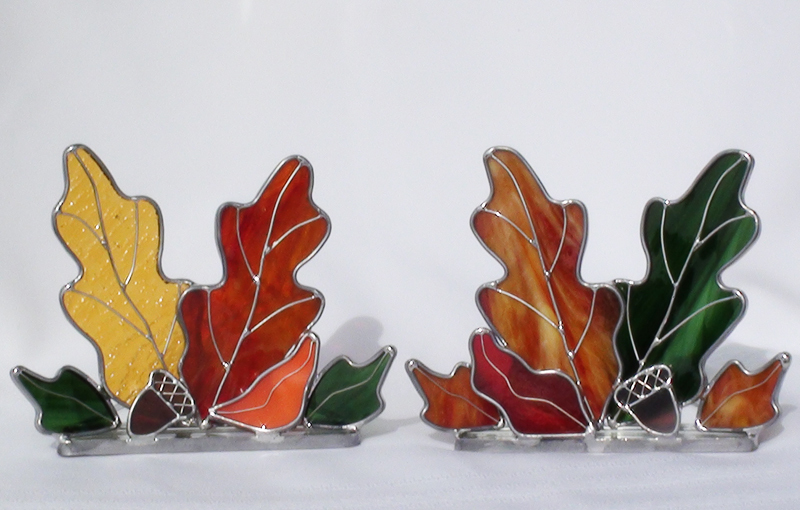 Click the photos to view each of the autumn-themed candle holders up-close. DESCRIPTION: The soft glow of a votive candle behind autumn colored oak leaves, will give your home a cozy feel with this stained glass candle. Two different colored oak leaves with wire stems and veins stand upright on a mirror base, surrounded by a small oak leaf, tiny leaves and a brown acorn. 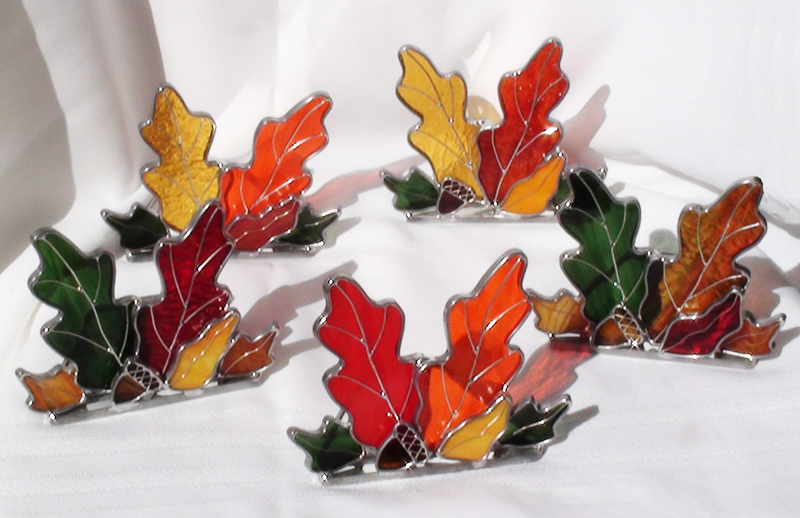 The oak leaves are different colors while the two small leaves are either green or matching shades of autumn colors. The small oak is a complimenting color to the larger oaks. The entire fall arrangement measures 6 inches high and 5 inches wide. The mirror base holding the votive candle cup is 4 inches deep. Oak leaf glass choices are available in numerous colors, clarity and textures. Due to the variety, the artist will make the final glass selection. Choose from the suggested color selections. For more specific color combinations please place a special order. 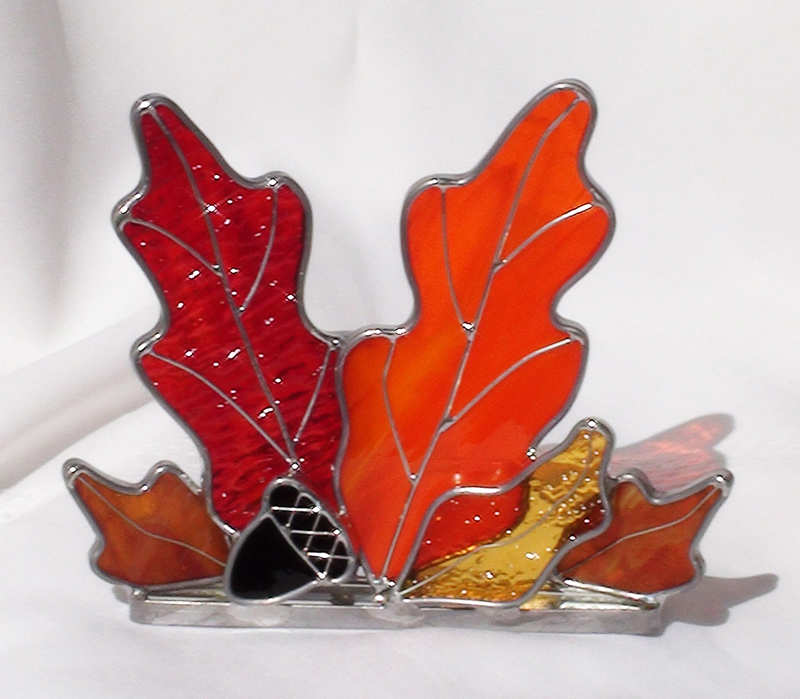 Various arrangements of hanging oak leaves as well as other autumn leaves can be found in other listings.